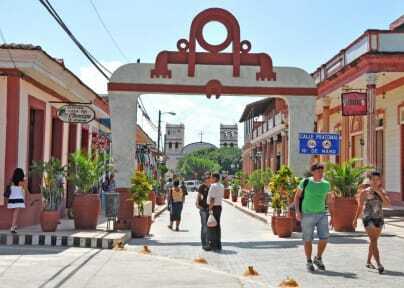 Casa Tropical is a friendly Casa Particular set in a charming colonial house in the downtown of Baracoa City. Casa Tropical is a typical Caribbean house offering all modern comfort for a great stay in Baracoa. Guests have access to living, garden and restaurant. Breakfast can be served upon request. 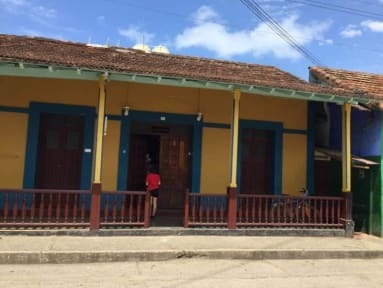 Casa Tropical is located in downtown of Baracoa near all main touristic attractions: La Catedral Nuestra Señora de la Asuncion, Parque Central, Malecon, and many restaurants. This property rents out one air conditioned rooms in which there is a private bathroom with cold and hot water 24 hours a day. Perfect room for a couple or friends, the room has a double bed and a single one. Guest have access to the garden and terrace of the house where you can enjoy the weather. Check-out time is 2 pm. Breakfast NOT included. 3 euros per person per day. Have really enjoyed my staying there. One of the friendliest family i met while traveling, def recommend to everyone Nice, clean and big room, delicious food - breakfasts and one of the bests dinner in 3 weeks in Cuba:), super central located…. Perfect location - 10 minute walk from the bus station and 1 minute to the centre. Host was great, offered both breakfast and dinner. Great value for money. Casa Tropical is just a minute from the main central square in Baracoa, and a few doors away from a supermarket. My comfortable ensuite room was large, air-conditioned and quiet. The owners are very helpful. Breakfast and dinner is available if requested. It is possible to arrange a taxi to meet the bus at Baracoa bus station which is hugely helpful.